Sometimes, you want a burger. Sometimes, you want a pizza. Actually, that's all the time for both. But when it's time to eat, you have to choose. Domino's Pizza has heard your cries and answered with the aptly named BurgerPizza. Part burger, part pizza, and all seemingly delicious, the newest product was unveiled just yesterday on the Domino's Pizza India Facebook page. Yes, sadly, this product is not yet Stateside. But if I understand how presidential elections work, this is something you can vote on in November. Needless to say, BurgerPizza is already wildly popular, with more than 24,000 reactions on this one photo alone. If you're looking for a bizarrely jargon-filled quote from a company executive about the BurgerPizza, you're in luck: Domino's Pizza India's President and Chief Business Officer Dev Amritesh offered a humdinger to Hungry Forever. "It only looks like a burger, but has all the goodness of a pizza inside,” he said. “Burgers in India are all-day escape and fun food while pizzas are becoming meal replacement and comfort food. The ‘all day, individual consumption occasion’ is an opportunity that is incremental to Domino’s. BurgerPizza is our offering for this opportunity." 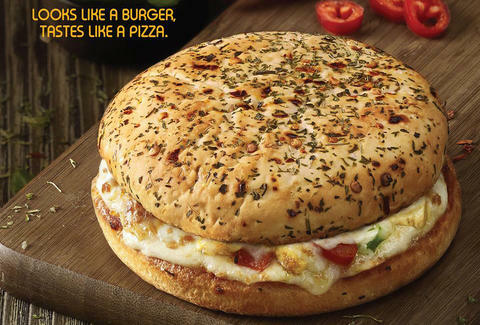 That almost doesn't sound like English, but the BurgerPizza is retailing for $1.31 (RS 0.89) around India and comes in two varieties: both featuring mozzarella cheese, tomato sauce and herbs and veggies, with one vegetarian and another stuffed with oven-baked chicken. As The Economic Times points out, burgers have been a growing sector of India's fast-food market, with the likes of Carl's Junior, Buger King and Wendy's jumping into the fray, while the pizza market has been fairly stagnant. This is the world's largest pizza company's chance to get in on that sweet burger action. Mmm... burger action. BurgerPizza action.